A proposal to hold a motoring gymkhana today would no doubt raise a few eyebrows, but they were not uncommon during the thirties decade. Henly’s Motor Group held an annual customer event each summer at Heston Airport while the Eastbourne concours d’élégance weekend also held an associated gymkhana. 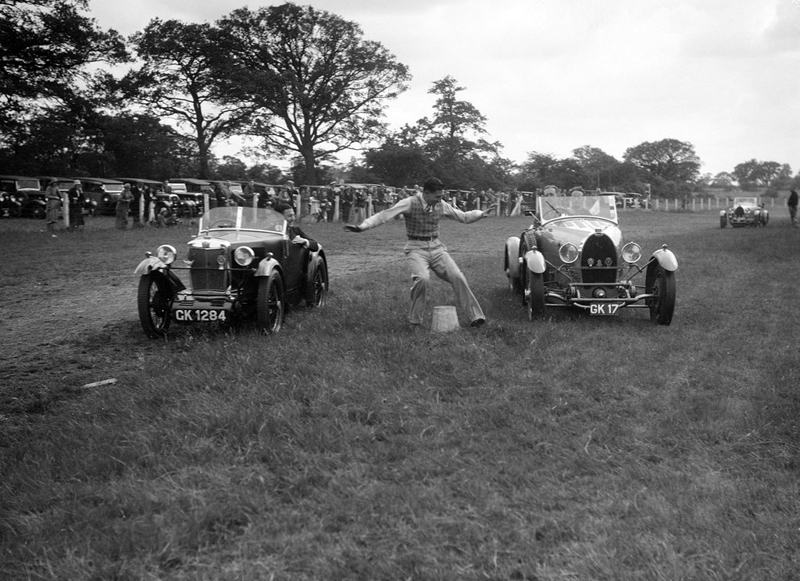 This photograph was taken in July 1931 at a similar event which on this occasion had been organised by the Bugatti Owners Club. The two (very recently) London registered vehicles involved are an MG Midget (GK 1284), seen here clearly leading a Bugatti (GK 17). The Midget’s driver is about to occupy, or be seated upon the the upturned bucket, although the purpose of the exercise remains a mystery to the writer. However, it does look like they are enjoying themselves!